Cats are often misunderstood, viewed as aloof, even selfish, solitary creatures with little affection for those around them. While a few may prefer life alone, most do not. Cats bond with humans as well as fellow cats on a deep, almost spiritual level. I like to think of cats as introverts and dogs as extraverts. Cats love just as intensely, but sometimes in a quieter, less obvious way. They grieve when they lose someone they love and never forget those who have shown them kindness. No two cats demonstrate the depth and devotion of feline friendship more than Jasper and Pickles. Jasper and Pickles were relinquished, along with many other animals, to Chicago’s Animal Care and Control (CACC) in the summer of 2015. They were malnourished and clearly from a neglectful home where both cats and dogs were fighting for food. 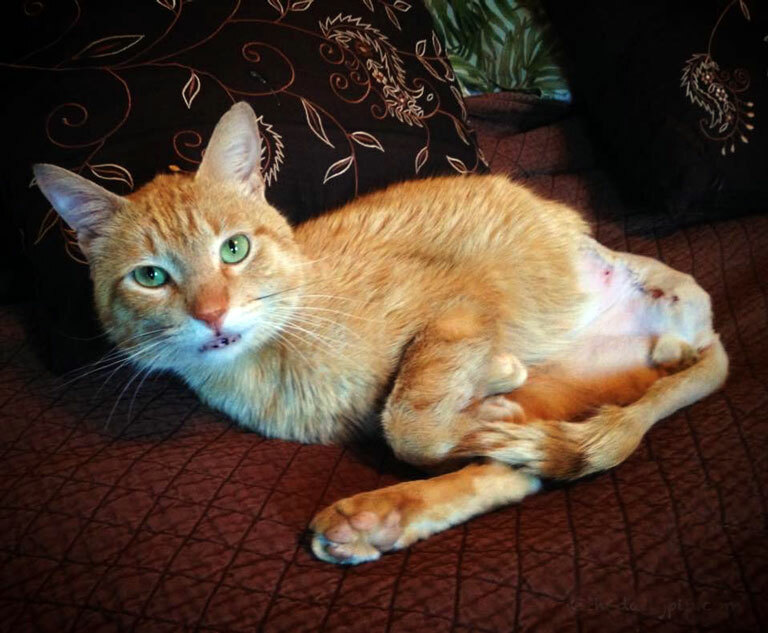 Because Jasper’s back leg had been gnawed off by a dog and was badly infected, he underwent emergency surgery. The vet estimated that his injury was at least two months old and the result of a fight with a dog, probably over food. In addition to his leg, he also had bite wounds on his head and ears and the teeth on his right side (top and bottom) were broken in half. Whatever happened, he fought with everything he had to survive. Jasper was rescued by The Critical Animal Relief Foundation (CARF) and sent to a foster home to recover. Pickles remained at Chicago’s Animal Care and Control alone. He was also extremely malnourished and suffering from a broken pelvis, the result of being punched or thrown. 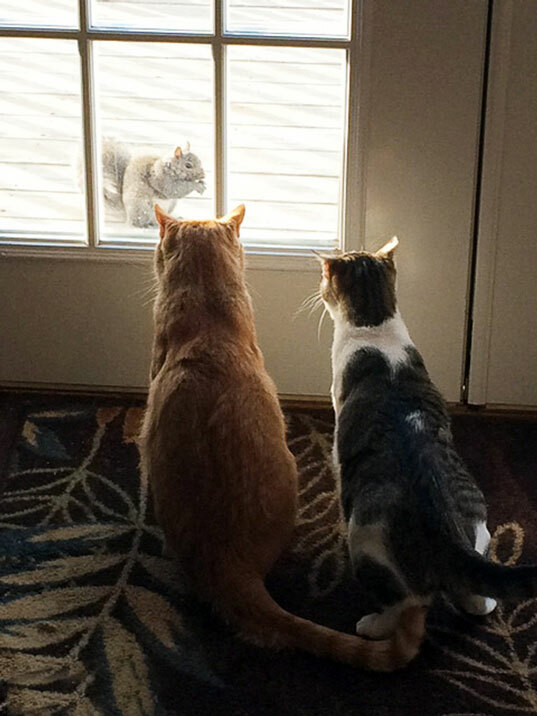 The two cats were unexpectedly reunited at the vet’s office a few weeks later. Placed by accident in neighboring cages, they immediately tried to reach each other by crying and sticking their paws desperately through the bars. Once they were placed together, there was a beautiful reunion full of cuddles, head-butts, grooming and purring. 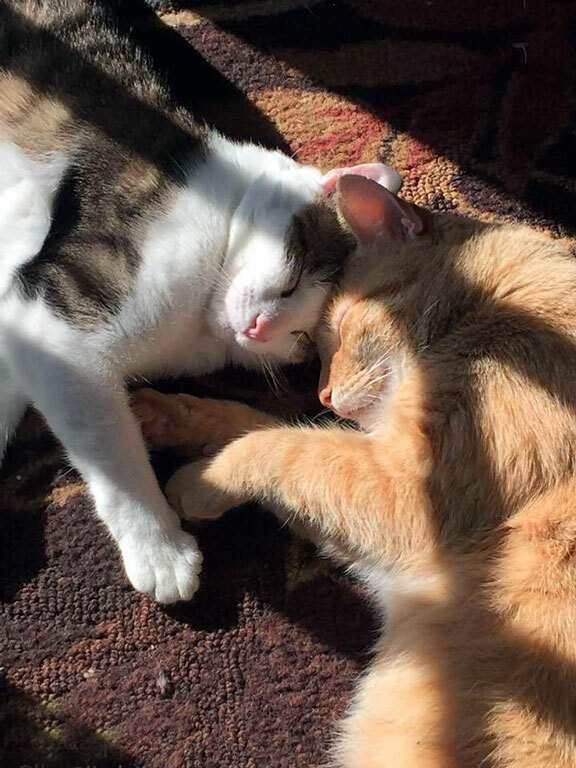 Pickles joined Jasper in his foster home and they have been inseparable ever since. Christina and Jim lost their 18-year-old cat, Jeepers, in April 2015 after a brutal final year filled with dialysis and other difficult medical treatments. Christina felt she could not go through the pain again and told Jim that she didn’t want to adopt another cat. But several months later, a friend sent her a video of Jasper and Pickles from CARF’s Facebook page. They played, snuggled, and purred; their bond and love of life shined brightly. Christina immediately called Jim and told him she wanted to meet them. Twenty-four hours later, they completed the adoption paperwork and bought Pickles and Jasper home. Christina says Jasper was a love from the start. He actively seeks out affection and a warm lap for comfort and love. He is curious, friendly, and engaging and even joins guests on the couch during parties. Because he had lived with his injury for several months, he adapted easily to getting around on three legs. The only exception are stairs, which take him a bit longer to climb. Pickles sometimes takes advantage of this by racing up the stairs for some one-on-one time with Jim and Christina. Once he hears Jasper, the alpha kitty, reach the top of the stairs, he scatters. Pickles has taken longer to adjust and still, at times, likes to keep his distance. Just recently he joined Christina on the couch for the first time and now occasionally lets her pick him up. Both Christina and Jim are committed to giving him the time and space he needs. They understand that he was hurt by humans and it will take time for him to learn to trust again. In spite of his past abuse, Pickles is full of energy and life. However, he remains slightly bowlegged from his injuries and sometimes hops instead of walks. Christina suspects their bond is based on shared trauma. Perhaps they relied on each other for survival, protecting one another from other animals and unpredictable, abusive humans. We will never know for certain what brought Pickles and Jasper together, but clearly their bond is unbreakable and will surely last forever. Jim and Christina recently purchased a beautiful new home with lots of big, bright windows, tons of open space, and a sunny deck where birds and squirrels come to feed. There are cat trees, beds, pillows and toys in every room and stairs leading up to the bed for Jasper. They even positioned the bird and squirrel feeders on the tree above the deck so that the cats would have the perfect viewing spot from the kitchen window. And when the landscape company came recently to trim the trees, they instructed them not to touch the tree with the feeders. As I listened to them speak so beautifully and lovingly about their feline boys, it was clear that they chose the house, at least in part, for the cats. Jasper and Pickles spent the first years of their life in a house of horrors with danger around every corner. They didn’t have enough food or I imagine even one comfy bed, and now they have three or four in each room. Although their bond was originally shaped by fear, danger, and survival, they now live a life of comfort, love and gentleness where all their needs are met in wonderful and extraordinary ways. Most importantly, they are together and safe and will remain so today and always. Jim and Christina are shining examples of compassion, devotion, and kindness in actions and life choices. Please join me in thanking them for giving Jasper and Pickles the fairytale ending they most certainly deserve. Thanks also to CARF for pulling them from CACC and helping them find their forever family. Jasper and Pickles are part of The Specials, an award-winning blog series focusing on special needs pet adoption. Senior pets, those with chronic medical issues, behavioral or temperament concerns as well as overlooked or misunderstood breeds like Pit Bulls and black cats. If not, for the courage and compassion of their adopters, many of these animals might have been euthanized in shelters or died alone and hungry on the streets. You can read more special needs adoption posts here. Disclaimer: Photos 1,2, 3 and 5 used with permission of Christina and Jim. These pictures are just breath-taking! What a wonderful story…we agree with Princess Leah..thank you so much for sharing! Another stellar post in the The Specials series. I'm so in awe of you! Yes,this certainly is another wonderful post. Many many thanks to Jim and Christine for taking Jasper and Pickles into their lives. Those two deserved to get such a wonderful home. I so enjoy hearing about all these rescues. Another beautiful story. I am so angry at the people who harmed those cats, but am thankful that Christine and Jim were able to give them the loving home they deserved. What an amazing story! It's sad to think of what Jasper and Pickles went through before finding such a loving and caring home with Christine and Jim. These cats look amazingly now! Bless Jim and Christine – such a beautiful story they have! Rescue animals can have sad, horrible stories – but with the right family to care for them, they blossom into loving, joyous and happy critters! This is such a heartbreaking, yet beautiful story with a wonderful ending! Thank yo so much to Christina and Jim for giving them a perfect home. And kudos to Rosie for this awesome series! Adoption does indeed save lives! Love that first photo. Jasper and Pickles are adorable! I'm so glad they found such a loving home. What a great story. This is a wonderful series! What a wonderful story! Bless Jim and Christina! This is such a lovely story that it made me tear up. I love that Jasper and Pickle's are best buds. Christina and Jim were very brave to take on these boys after losing their own pet. Cat besties! What a lovely story about the bonded pair. What an amazing story of two wonderful kitties who have more than earned the right to live the good life together. "Less-adoptable" cats are wonderful companions! What a great story. It's great that the shelter workers noticed their wanting to be together and put them in the same cage. It's even better that they were adopted together. I love seeing pics of snuggling cats! What a wonderful rescue story! Beautiful kitties. Wow — what a story! What began in heartbreak and sadness has ended in happiness and love. We are happy that Pickles and Jasper now have the perfect home with loving humans to take care of them. Thank you for sharing their story. What a wonderful story. The bond between Pickles and Jasper is amazing. Paws up to Christina and Jim for giving them the loving home they so deserve. What gorgeous kittys!!! I loved their story and I loved they found each other again and are happy in their new home. Your story had tears rolling down my face. It was truly amazing! What a beautiful story! Congratulations to Pickles and Jasper. And to Christina, too. Such a wonderful story. We're so happy for everyone involved in this wonderful adoption story. Oh my goodness!! Just beautiful! Brought me to tears! Jasper and Pickers look so happy to have each other, and their new family! Such a great story, thanks for sharing. what a wonderful heartwarming story. I love happy tails like this #rescuesrock. So inspiring. Wow. This is incredible. Who allows this to happen to animals? It's interesting they bonded rather than also fight with each other. Good to see they're home – should have happened sooner. Applause!!! What a wonderful happy ending. While their situations were so sad, the happy now is what the world should be like for every critter. I love this. We have rescued and rehabbed many, keeping several who were just "ours". They are so special. Thank you. Just fantastic! This post made me cry. Thank you Jim and Christina for opening your hearts and homes to these two! I just re-read this story, and of course, have tears in my eyes. So happy they Pickles and Jasper were adopted by this wonderful couple and that they now have the life they deserve.